If I couldn’t garden, I’d be just as content to be a beekeeper… both hobbies provide a similar sense of wonder and satisfaction of managing something that will never be mastered or fully understood. My fascination with beekeeping began years ago when I lived on an organic farm and adopted a somewhat feral colony on the property and also collected swarms that were spotted in the nearby town. More recently I’ve maintained an expanding population of native solitary bees in the backyard but this summer I decided it was time to try my hand at backyard beekeeping. Top Bar Hives are popular in less developed countries because they are easier and less expensive to build and maintain. 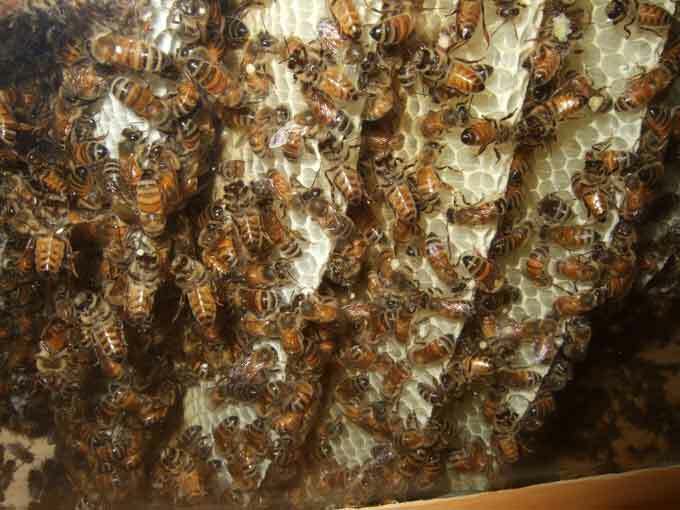 They are growing in popularity among organic and backyard beekeepers for their management techniques and use of foundationless comb. On the downside equipment specs are not standardized and it is not as easy to find mentors that have experience to share with newbies. After more research and a discussion over the pros and cons I decided to start with a top bar hive… actually two top bar hives for reasons that I’ll share later. Fortunately I found both an area beekeeper; Mike Thomas of Bjorn Apiaries, and a local bee club; the Pennsylvania Backyard Beekeepers Association that would help me on this journey. Last winter was spent reading a stack of books on beekeeping that only made me more impatient to get started. 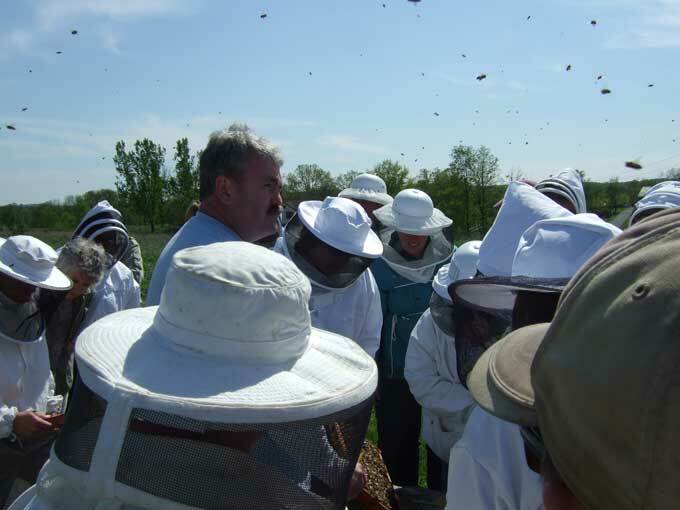 This spring offered opportunities to build the beehives, attend a PennApic sponsored workshop, and complete classes on “Sustainable Beekeeping” and “Queen Rearing” that were offered at Bjorn Apiaries. Everything was set in early May for the arrival of two three pound packages of bees that were shipped via the Postal Service and received special treatment that I noted on Facebook. Things started off shaky when I clumsily received my first and only sting so far, and with the discovery that one of the packaged queens was dead on arrival and a hasty replacement had to be arranged. It has gone incredibly smoothly since then! The colony that suffered the loss of their queen has been dubbed “the Slackers” because they were so far behind, but now they have hit their stride and are making up for lost time. I love the observation windows on the back of the top bar hives that enable me to peek inside at anytime without disturbing the bees. Initially I had concerns about keeping the bees in a residential neighborhood but the girls have been well behaved and haven’t caused a stir. I checked into local ordinances but didn’t advertise the fact that there were now two beehives in my backyard. While only one neighbor can actually see the hives, it didn’t take long for word to get around, and surprisingly the neighbors seem just as fascinated by them as I am. The beehives are located only about thirty-five feet from the patio but I wouldn’t even know that they were there by the amount of bee traffic close to the house. Some races of bees are gentler and better suited for a backyard setting, mine are a mix of Italian, Russian, and Carniolan stocks that make for an easy to manage bee with good honey production. Last week I added a third hive with a nuc of beautiful bees from Bjorn Apiaries that is in the more familiar Langstroth style hive. I may use a split or swarm to add one more hive to the backyard next spring but that would be about the max that I would want to keep here at home. It really is easier to start with two hives rather than one and I’m glad that I followed that recommendation. The advantage of having multiple hives is that you can share resources by pulling honey, pollen, or even eggs and brood (baby bees) from a strong hive to help build up a struggling hive. It’s also great for a new beekeepers to have a reference point and compare one hive to another as they learn. I probably won’t have any surplus honey to harvest before next summer and the real test will be to see how well the colonies survive the coming winter months. Until then I will continue to observe and discover more about the interesting and complex life of the hive and the honeybee. If you want some firsthand experience or even a hive or two of your own, a good place to start is to locate a bee club in your area. 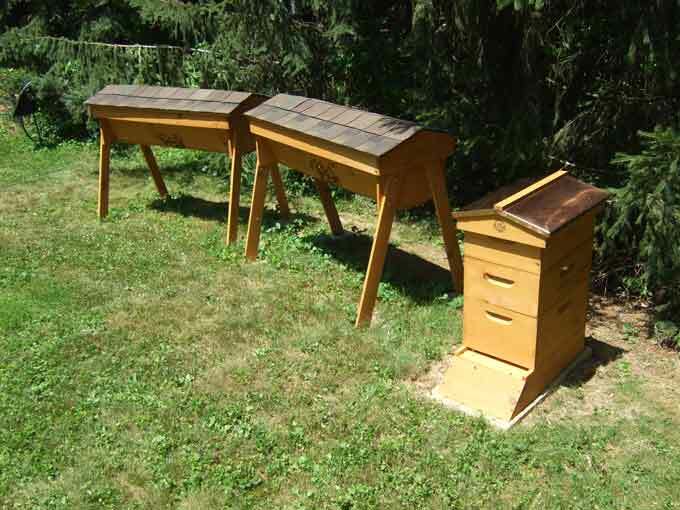 There are also bee schools run in many states and local apiaries that offer workshops and classes for beginners. Beekeepers are a friendly and helpful bunch that will go out of their way to provide assistance to a new beekeeper. If you live anywhere close to Pennsylvania consider becoming a member of the Pennsylvania Backyard Beekeepers Association or just drop in on their annual summer picnic to get a taste of what it’s like to work closely with bees! I’d love to keep bees and have several friends who keep them. I’d want to learn as much as possible so I think a beekeeping course might be in order. Here in Yorkshire I’m lucky to be able to head up onto the Moors where there are lots of bees that love the heather. Last week we walked into Dalby Forest and the moors were alive with bees. Thanks for the interesting article! I think it’s wonderful your adventurist green spirit! I find that as I grow as gardener I am delving into more and more arenas. I’ve joined garden clubs, gone on garden tours, and if not just only in my mind pictured myself having a small brood of chickens and even a beehive or two in the back yard like my neighbor and friend Katie. Being that I am in the planning stages, checking ordinances and considering costs to everything it is taking a while. Plus considering what I can and can’t maintain alone. But nothing is wrong with dreaming and thanks to you and Katie I am dreaming of a little bigger and sweeter harvest in the garden. You’re welcome Alan, thanks for reading and commenting about the bees near Yorkshire. Thanks Tina, beekeeping is an adventure and it’s amazing to learn and watch the operations of the hive. Good luck to you in setting up a hive of your own. 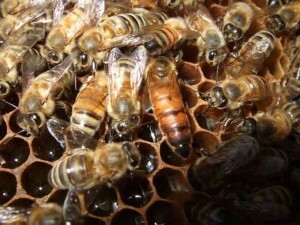 One British source of top-bar hive information you might enjoy is the forums at biobees.com. And I’ve learned a lot from the organic beekeepers group on Yahoo Groups. I have read somewhat about beekeeping. I find it cool that your neighboors did not create an opposition when they knew that you had bees at your home. Thanks for sharing your experience. HI Kitt, I have heard of Biobees but not the Yahoo beekeeping group, I will check it out. Thanks, and you enjoy your bees also! Titou, yes I’m glad that the neighbors didn’t freak out at the thought of having bees nearby and I’m doing everything that I can to be a responsible backyard beekeeper and to ensure a peaceful coexistence. Hi Joseph, two hives and the basic gear to get started would probably run about $300 and the bees themselves can add another $80 – 100 per colony. You could reduce the cost by building your own hives and you can sometimes obtain free bees from a swarm or a beekeeper who has a hive that can be split. Good luck! Wow…you’ve piqued my interest! I think I will start reading about bee keeping and see if I can find a bee group around here. Thanks! Certainly would help pollination. Local honey ought to do my allergies good. By the way Kenny, thank you so much for a place on your blogroll. I have changed the name from In the Charamon Garden to West Texas Gardener. I hope I can stay on your blogroll. I enjoy your posts very much. Kenny, great stuff on your site and enjoy your experiences in gardening. I’m looking into backyard beekeeping and have visited the York County Beekeepers Association. Reading an researching on how to start a bee hive. It should be fun! Thanks for all the information. Sam, beekeeping is definitely something that you want to go into with a good feel for what you are committing to and it isn’t for everyone! Good luck Dwight and I have updated your link on the blogroll. Thanks Bob, if you’re in PA I would highly recommend that you check out the Pennsylvania Backyard Beekeepers Association.